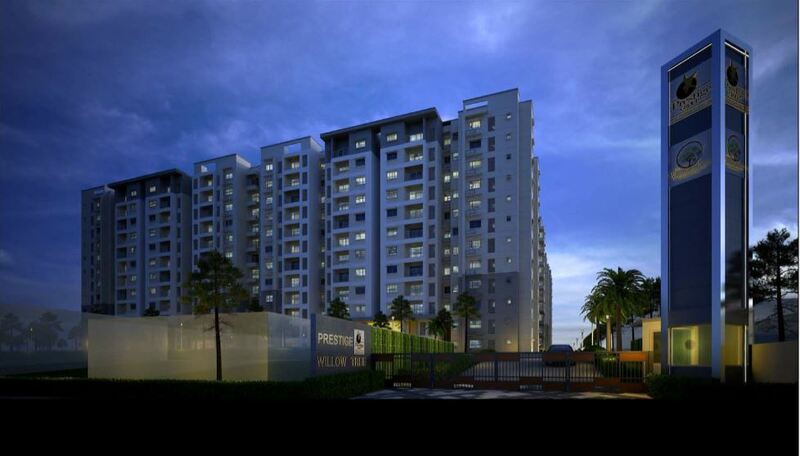 Prestige Willow Tree with 1BHK, 2BHK and 3BHK apartments at Vidyaranyapura. Get exact location and price. A little insight into the Prestige Willow Tree! Prestige Group as you may be well aware of is a top real estate company in the present day. The group has several prominent projects going on in many cities around the country. The group mainly focuses on constructions in the southern cities like that of Bangalore, Pune, Hyderabad and others. One such top protect is the Prestige Willow Tree which is located in the Vidyaranyapura in Bangalore. It is one of most sought out projects in that region. Apart from its lush green surroundings– the project comes from a well-reputed group like that of Prestige. The Prestige Willow Tree spans up to an area of 6.75bu acres of green space. The project will offer 451 apartments. It is in close proximity to Jalahalli and new BEL road. It is built by some of the best in class architects and floor designers. And it has been revealed that 75% of the total area is wide open spaces. The clubhouse which comes along with the project covers an area of around 25,000 sq. ft. There is a whole list of options that this comes along with this project. Prestige legacy in the real estate market: Prestige Group is a top construction company that had been present in the market ever since 1986. Known for breathtaking architecture and customer friendly approach– the group has been successful in going off its roots. It has been a part of a no. of residential, commercial and corporate infrastructures. It has a turnover of more than 3518 crores. It is an ISO 900:2000 certified corporation and you can blindly trust the group with your money. The group has been a part of 210 successful projects which covers more than 80 million sq. ft. of the area. There are 53 projects that are still ongoing which covers an average of 54 million sq. ft. of the area. The Prestige Willow Tree is one of them. The prime location in which it is located: The next significant aspect which one looks for before choosing a project is its location. The company has always been successful with its location because it mainly focuses on customer-centric ones. The Prestige Willow Tree Vidyaranyapura is situated on a place which is in high demand in the city. The place is well connected to all significant places around it. It is in close proximity to education centres, hospitals, restaurants, shopping complexes, and metro station. The International Bangalore Airport is just at 40 minutes’ drive from the project. The amenities and price factor: Looking at all the aspects from a neutral view– the Prestige Willow Tree price factor is the most prominent one in choosing the right project. The apartments are available from 30 lakhs and above. Several amenities include swimming pool, gymnasium, security, lift system, power backup, sports facilities, kids play area, rainwater harvesting, jogging track, library, etc. This project will turn many eyes towards it. So in the investment sense too– the project will provide you with an exceptional amount of return.